Disney's Aladdin is featured on this wonderful Disney Aladdin Thomas Kinkade Hanging Acrylic Print. 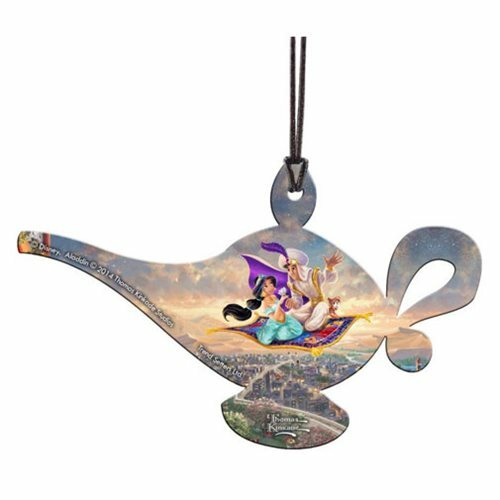 Shaped like a genie's lamp, it shows Aladdin and Jasmine soaring above the city with Carpet and Abu, and like all works by Thomas Kinkade Studios, the image is full of color and detail. This 4 1/2-inch wide x 2 3/4-inch tall decoration has light-catching properties, so natural light illuminates and emphasizes the artist's skillful use of color. It's perfect for any Disney lover or hopeless romantic to hang in their home or car! Hanging string included.